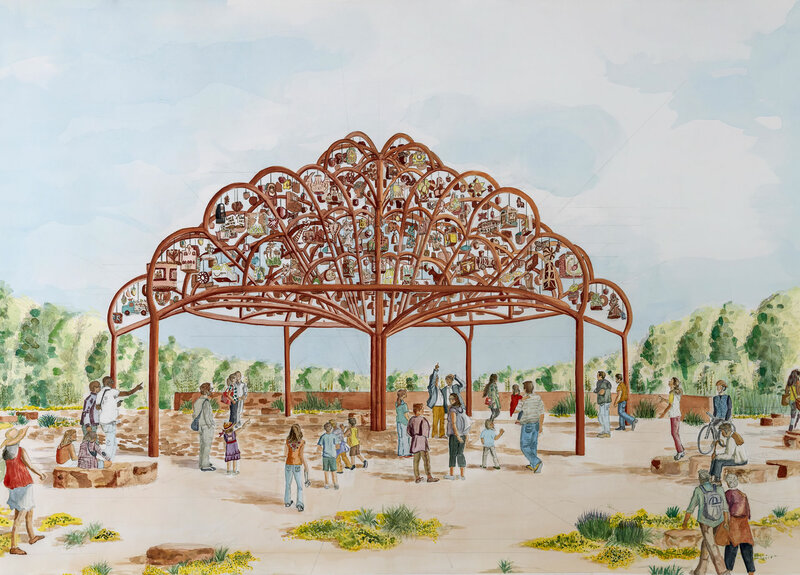 Árbol de la Vida: Memorias y Voces de la Tierra celebrates San Antonio’s ranching heritage through the eyes of the community. 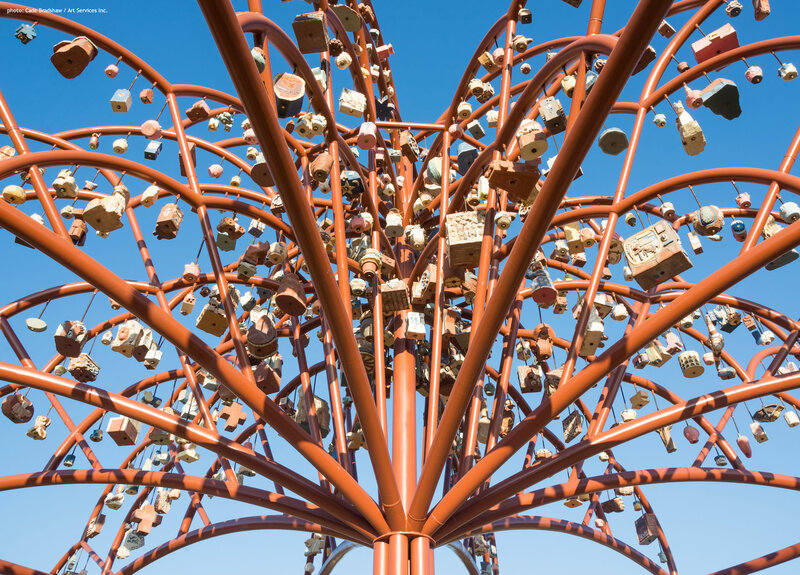 This collaborative public art project brings San Antonio together by artistically giving form to our shared story. 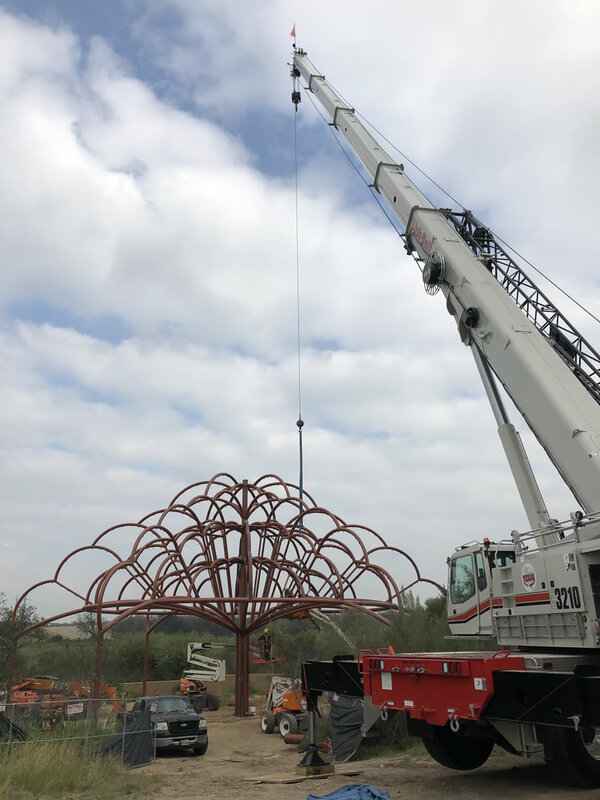 This iconic sculpture will complement the San Francisco de la Espada World Heritage Site and bring focus to the rich natural and cultural environment that surrounds it, one story at a time. 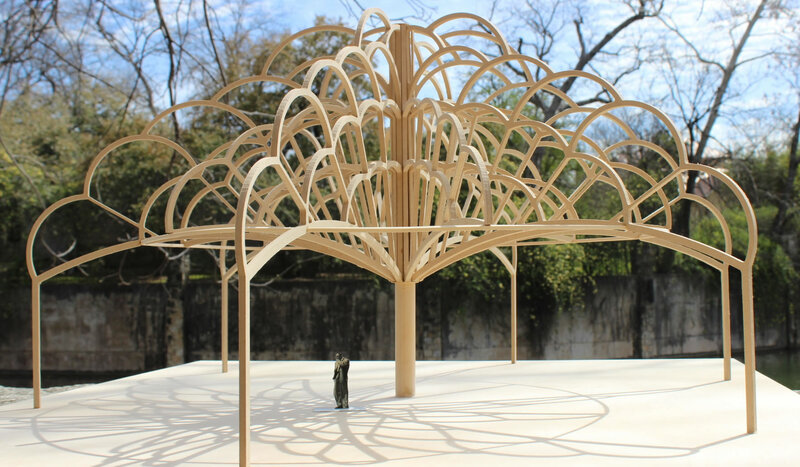 Inspired by the region-specific history of ranching, Árbol de la Vida: Memorias y Voces de la Tierra is a physical reflection of stories crafted by the people of San Antonio. 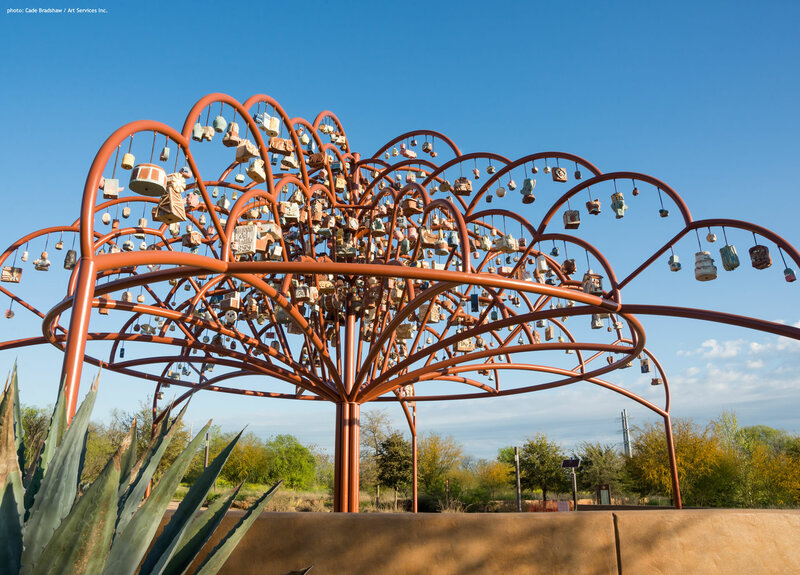 Adorning the steel tree-like structure is 700 clay sculptures made by community members—many of whom worked closely with Cabrera as they had no prior sculpture experience. The objects reflect the ranching heritage themes and stories related to collectively rich traditions. 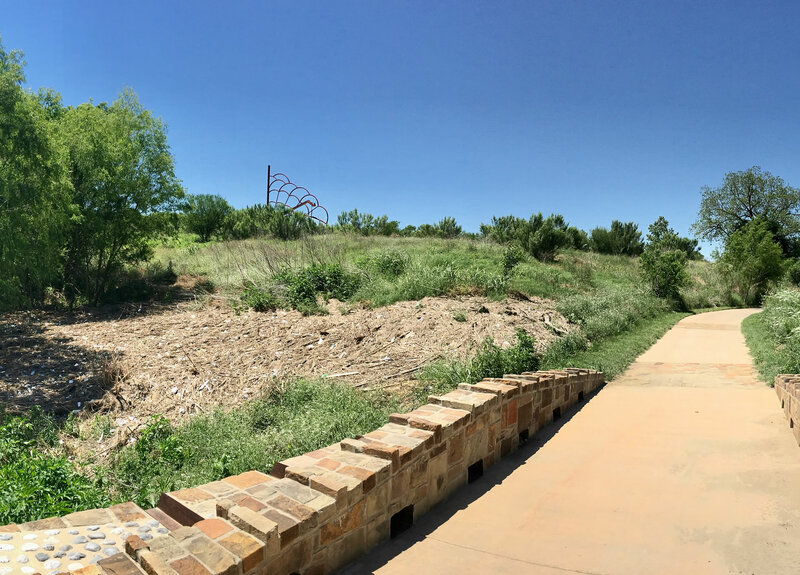 Primary funding for this San Antonio River Foundation project is secured by a generous donation from Ramona and Lee Bass. A 6th generation Texan and native San Antonian, Ramona was raised near her family’s Seeligson Ranch. She and her husband Lee live in Fort Worth, but spend as much time as possible at their ranch in South Texas. They are excited to share their enthusiasm for the ranching heritage and traditions. Additional funding in partnership with the City of San Antonio’s Departments of Arts & Culture and Parks & Recreation. Mission San Francisco de la Espada is currently understood as the only Spanish colonial mission in the United States which maintains contact with its original ranching operation: Rancho de las Cabras. Texas’ ranching legacy can be attributed to the initial efforts of the mission ranches. The rancho’s ruins and pastures can be found approximately 30 miles south of San Antonio in Floresville, TX.